All my children went there, the nursery entrance was tiny and the classroom very small. Anything that can help small children ( or even bigger ones) play and learn in safety gets my vote. No paddling pools ( always a thorn in my side) parks that are neglected and run down, two swimming pools disappearing, Manor place and Grange road. And Charles dickens even had a small swimming pool in the school! Was a good school and the lovely Mrs.Robinson was in charge, then Mr Newell. The CD school website does not show the overall plan of the project, and does not show any impression either of what will happen to the former Lant Street site. I did take a picture during the consultation and will post it if the website allows, so people who are interested can see it for themselves(does someone know whether pictures can be posted?). The "KS1+2 playground" is about the same size as the space described as "outdoor classroom" and is less than half the size of the "MUGA". Does anyone know what "MUGA" describes? Overall, the "KS1+2 playground" is less than 1/5 of the sum of the land dedicated to the outdoor classroom, the structure and the "MUGA". This mirrors what is planned for the other side, i.e. on the current main playground. What is now a free, open space will be replaced with outdoor classroom/allotment etc space/"quiet space not for running"/or even gangways surrounded by railings. Btw, this is not shown on the plan, but is based on the explanations given during the public meeting. Looking at the plan, less than 1/5 of the current main playground will remain, and will be fenced in by buildings/overlooked. The letter we received from the Council states that "a safe, rooftop area [will] compensate for the loss of the ground floor area, so that no outdoor play space will be lost". However, this is incorrect because the new spaces are designed completely differently, are aimed at uses which are inconsistent with free play and are not even technically "outdoor". (b) that it couldn't accommodate more children. Why is the plan to sacrifice the main playground, which has served generations of children, in order to create other types of space. Is it proven that these spaces are equivalent? What is better for children, using space for "outdoor classrooms" which duplicates space used indoors already), or leaving the space open, not cramming it with "other uses", and allowing them to run freely, even in a straight line if they wish? Aside from this, I am concerned about the whole public consultation process because we were invited to go to a public consultation, and to comment on the plans, however in practice we are not given the means to do so. The Council and architects expressed that they were keen to receive comments from the residents, but in effect this is impossible for people who did not make it to the consultation because the plans are not available. Susan Fuller (Southwark Council) said that unless people make comments at this stage there is nothing for Southwark and the architects to take into account, and the next opportunity to comment/object will be at the planning application stage. Obviously the plans would be crystallised by then. 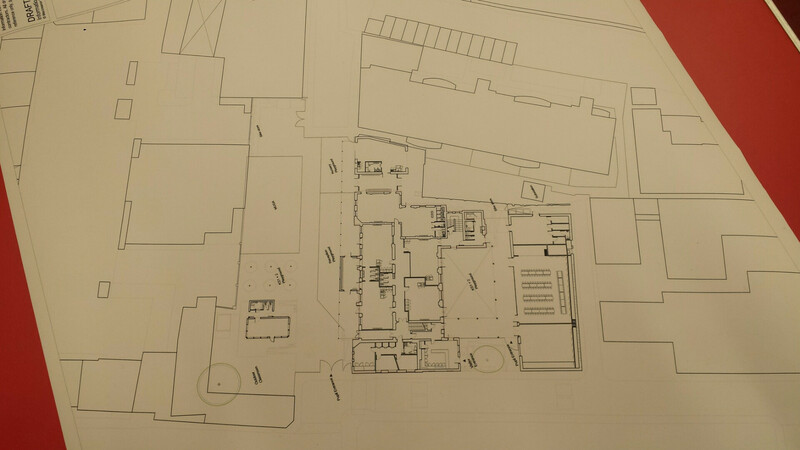 And finally, to go back to Caroline’s initial post on Tuesday, the plans will have substantial detrimental effect on the immediate neighbours of the school. The construction work will taking 9 months + building time to complete. The new structures on the main playground will have open gangways and partly an open floor on its roof - the total height will be in the region of 12 - 15 metres above ground. These new structures will overlook balconies and flats and take away light and space. And, last but not least, the school is not always considered a very good neighbour. There is already a lot of noise nuisance coming from the school, including in the evenings and at the weekends. What use will the school make of these new "above ground"/semi open spaces? Any concerns about noise were met during the consultation with either blank looks or “you live near a school, what do you expect” type comments. I think the "MUGA" will be a Multi Use Games Area - great. It seems to me that it might make more sense to build on the Lant Street site. The problems re utilities etc don't seem insurmountable. But the residents would probably go into meltdown over such a proposal. So the only place to build is the existing main playground. The existing playground is not, incidentally, a particularly brilliant shape, especially for PE lessons. It is actually pretty small too. Lant Street would provide a better, flat playground. The Lant Street area is quite spacious. If they convert that to a proper playground the children should have plenty of space to run around, no? Yes, it would be great for recreation and for teaching PE etc. Everyone, apologies, I haven't done a very good job at pasting the picture of the plan in. However, as it's so big at the moment, note that the main playground is on the side of the "Visitor Entrance" (the visitor entrance, as now, will open on to Toulmin Street). What is now the main playground will be reduced to what is marked as "KS1+2 playground". A few people have commented that the main playground isn't that big anyway and not adapted for PE etc. However, if the plans go ahead, there will be hardly anything left. Finally, the plans do not make clear that there will be elevated walkways going from the existing building to the new structures, i.e. what will be left of the main playground will be surrounded by structures. As for the (former) Lant Street side of the site, you can see that it will be very crammed (the "Reception Playground" and "Nursery Playground" are clearly notional, there just isn't that space there).